Hotel Andaluz, a leader in eco-friendly hotels based in Albuquerque, New Mexico, is partnering with Rainbow Ryders, Inc. to offer guests a two night luxury stay at the hotel, paired with an exhilarating experience with the premier hot air balloon ride company in the Southwest. With the “Enchanted Skies” package, guests will not only have the opportunity to stay in a AAA Four Diamond, historical hotel in the heart of Albuquerque, but they will experience the breathtaking beauty of the city during a hot air balloon ride with Rainbow Ryders. Priced from $299 per night for a two night stay, the “Enchanted Skies” package includes several exclusive features, including deluxe accommodations for two, a one-hour sunrise hot air balloon ride with Rainbow Ryder, Inc., transportation to and from the hotel and the launch site in Albuquerque, and a light continental breakfast and celebratory toast after the flight. Guests will also receive a commemorative lapel pin and flight certificate. Rainbow Ryders Hot Air Balloon Company has been providing fun and safe balloon rides for over 30 years, and offers balloon rides every morning at sunrise year-round. They offer sunset flights during the winter. 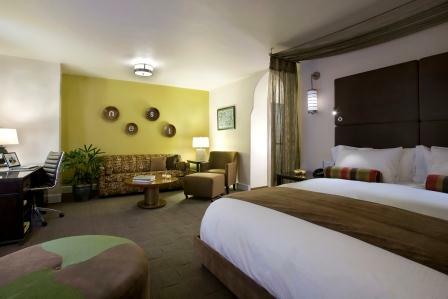 A leader in eco-friendly hotels, Hotel Andaluz has a rich history in downtown Albuquerque, New Mexico. 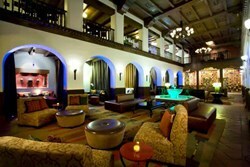 The fourth hotel ever built by Conrad Hilton, Hotel Andaluz was returned to its former glory in 2008 by current owner and local resident Gary Goodman. Hotel Andaluz is the only Historic LEED Gold Certified hotel in the Southwest and the only AAA Four Diamond Hotel in Downtown Albuquerque. With 107 rooms and suites with a variety of meetings, Hotel Andaluz is the only boutique hotel in the City Center and a popular destination for parties, business meetings and weddings.